The German settlements were primarily comprised of ethnic Germans or German language speakers who migrated from western Europe from the modern states of Germany, Denmark, France, Austria, Belgium, and Sweden. Upon arrival in Russia from 1764 to 1767, the colonists were placed in ethnic villages according to their religious beliefs. The primary languages spoken in the colonies were the German dialects brought from their homelands. Although the colonies were almost exclusively comprised of these new immigrants to Russia, there were many ethnic groups living in the same region including the Russians, Malorussy (the term "Little Russians" was applied to Ukrainians), Chuvash, Bashkirs, Kalmyk, Kyrgyz, Mordvins, and Tatars. Many of these nomadic groups lived in the region long before the arrival of the Russian military in the 1500s and the German settlers in the 1760s. 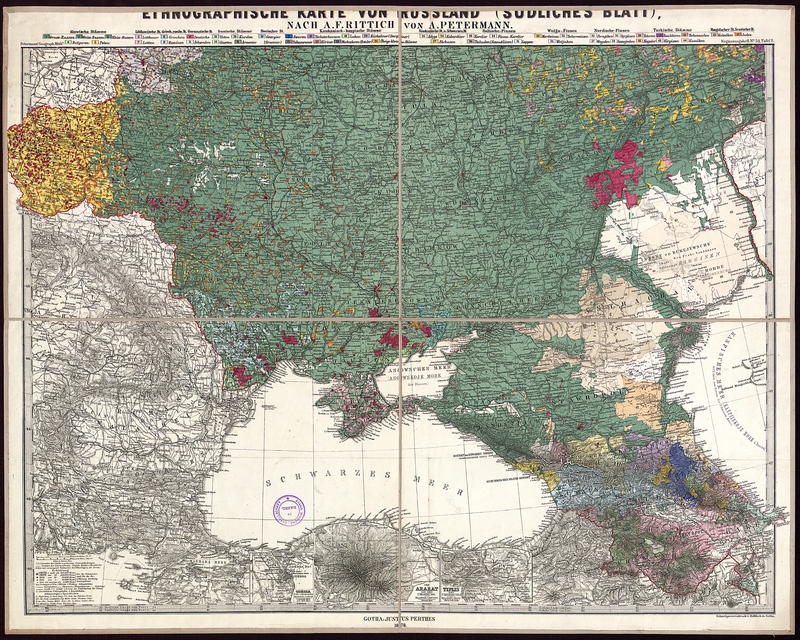 By the eve of World War I, Russia was strikingly diverse with only half of its population comprised of ethnic Russians. Some refer to Russia as a "stew pot" in contrast to the American stereotype of a "melting pot." 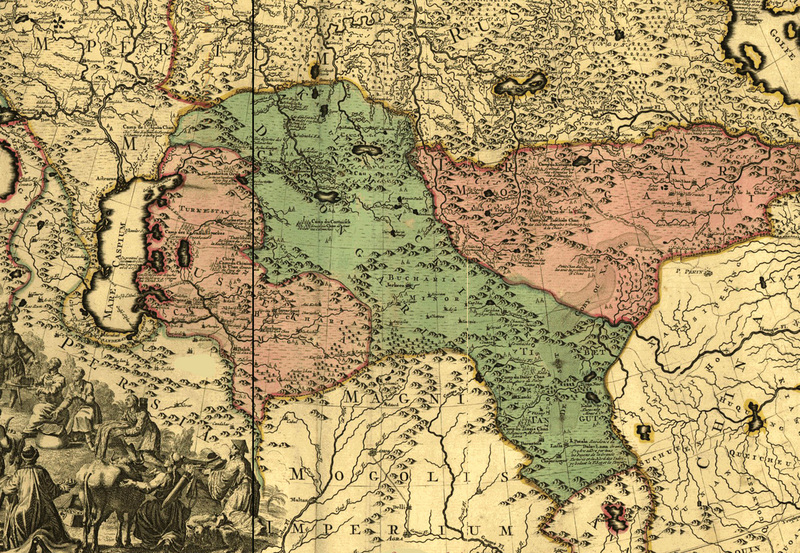 Map of Uzbekia, Kalmykia and Tataria in 1720. These domains were only a short distance to the east of the what would become the Volga German settlement area. Prior to the arrival of the Volga Germans in the 1760's, the Uzbek, Kalmyk and Tatar tribes were predominant in the region. Source: Wikimedia Commons. The location of the German colonies along or near the Volga River and the Astrakhan road increased the colonist's contact with other ethnic groups who traveled along these ancient trade routes. Ethnic Map of the Volga Region (1901) Source: Russia : Full Geographical Description of Our Country (St. Petersburg: A.F. DeVries, 1901): n.61. Legend of ethnic groups in descending order: 1. Velikorussy [white] ("Great Russians") 2. Malorussy [pink] ("Little Russians") 3. Tatar [yellow] 4. German [blue] 5. Chuvashia [aqua green] 6. Mordvinia [brown] 7. Cheremysy [pale blue] 8. Bashkir [purple] 9. Votyaki [black diagonal lines] 10. Kalmykia [green] 11. Kyrgyz [pale green] Translation of the legend courtesy of Heather Arndt Anderson. 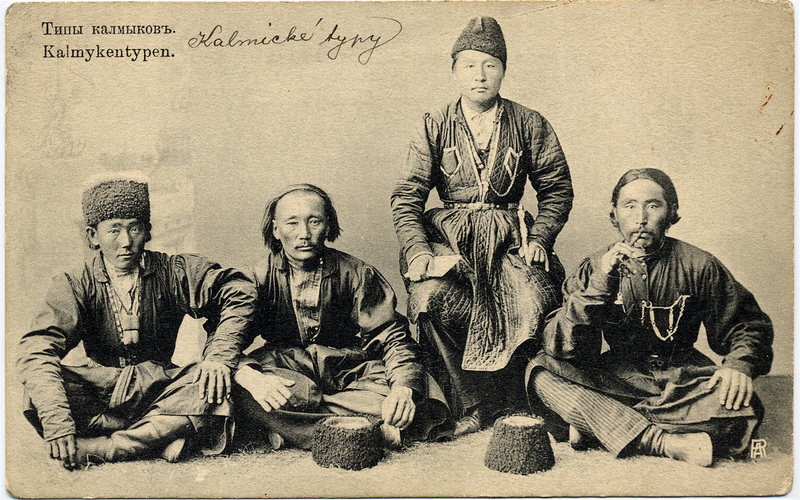 Postcard of Kalmyk tribesmen in Russia from the early 1900's. Source: Steve Schreiber. A map depicting the Races of the Lower Volga. 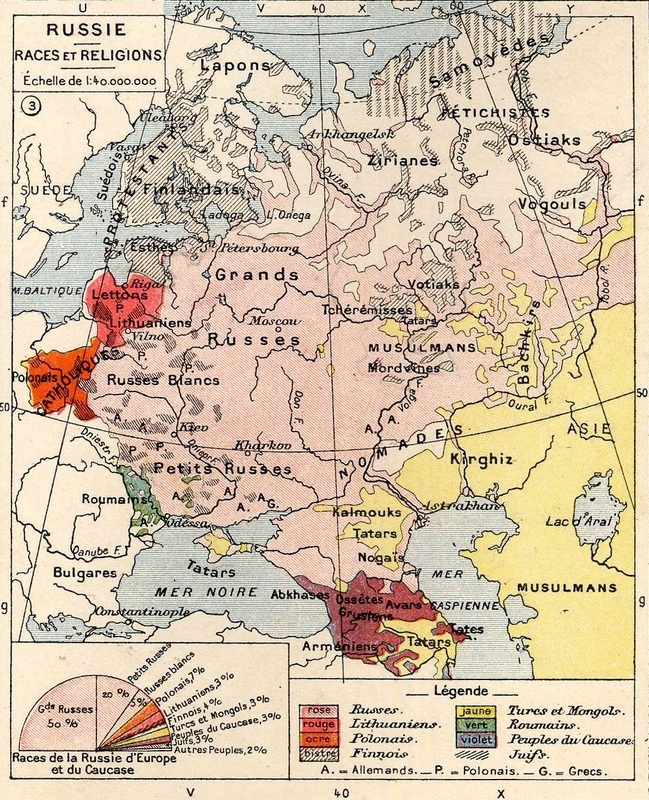 Source: "Russia in Europe," published circa 1890. 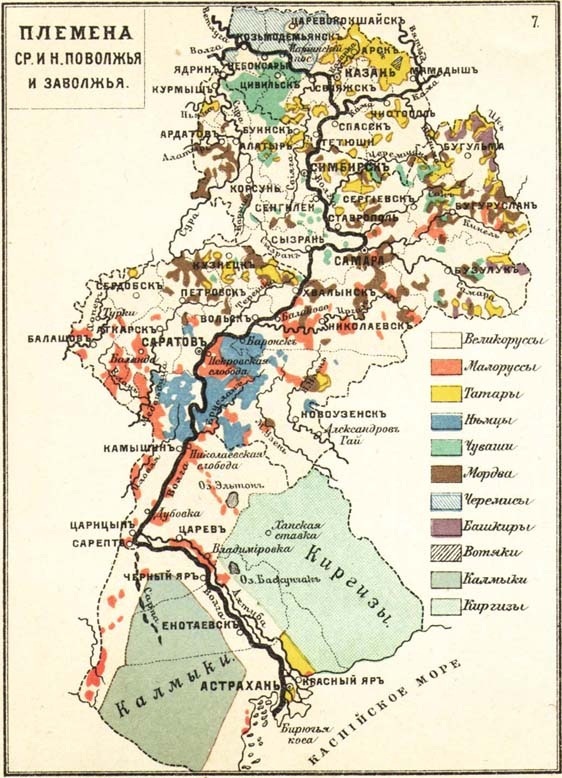 Ethnic map of Russia in 1898. The symbol "A." represents "Allemands," a French word meaning "Germans." Source: Wikipedia. Disputes, rivalries, envy or other hostilities did not exist; one lived peacefully side by side, but at a distance. While the people of Norka did live peacefully with their Russian neighbors for the most part, stories told by Conrad Brill and others indicate that there was occasional rivalry and tension with their Russian neighbors who viewed the Germans as privileged foreigners. Beginning in 1871, reforms were made by the Russian government to remove the privileges granted to the Volga Germans by Catherine's Manifesto. Discrimination against the German Russians increased during World War I and ultimately led to their deportation and near extinction as an ethnic group. 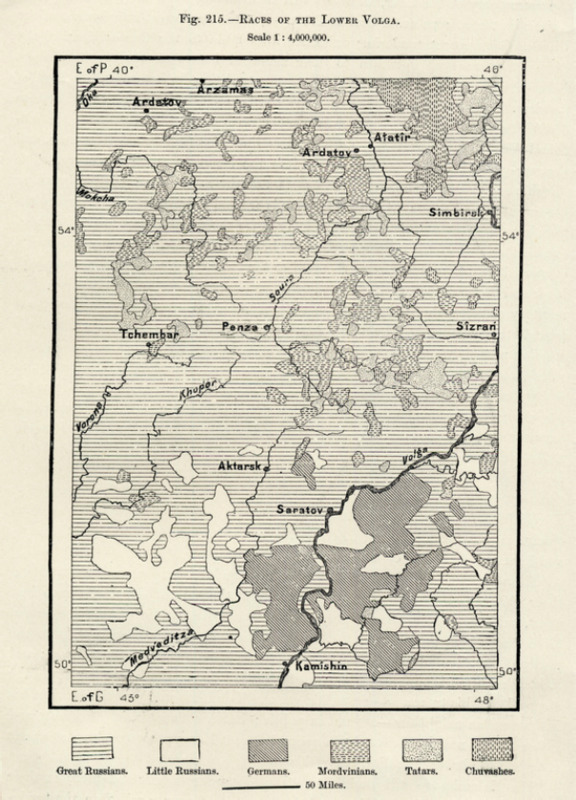 1878 map titled "Ethnographic map of Russia (southern sheet)". Used with permission of the Basel Archive Ref. number: BKARVAR-31.011. German settlements are shown in red. The Volga settlements are located in the upper right quadrant and Norka is shown. Click map for a larger image.